Before The Emails or Benghazi or a blue Gap dress, Hillary Clinton dealt with a much less controversial stain on her character, which was that she reportedly liked to gab with high-profile dead people. In the 1996 book The Choice: How Bill Clinton Won, author Bob Woodward, no stranger to a good scandal, wrote that the former First Lady communicated with Eleanor Roosevelt and Mahatma Gandhi during her husband's term—though not Jesus, as that would've been, according to Woodward's retelling, "too personal." "I occasionally have imaginary conversations with Mrs. Roosevelt to try to figure out what she would do in my shoes," Clinton wrote in a newspaper column. "She usually responds by telling me to buck up or at least to grow skin as thick as a rhinoceros." Sensational interpretations quickly followed: Clinton was holding seances in the White House. Alas, the fun didn't last long, as sacred psychologist Jean Houston responded to Woodward's assertions, clarifying that Clinton's chats were simply "imaginative exercises" to help with Clinton's book project. But while Clinton preferred to keep her scandalous activity tied to the here and now, other First Ladies weren't so dismissive of the occult. From communing with the dead to palmistry, spiritualism has attracted many First Ladies, especially as a strategy for dealing with the demands of living and working in the White House. While it's possible some Ladies were better at concealing their practices, five in particular—Jane Pierce, Mary Todd Lincoln, Edith Wilson, Florence Harding, and Nancy Reagan—held moderate-to-strong interests in the occult, according to Pat Krider, the executive director of the National First Ladies' Library. That list could also include Grace Coolidge, Roosevelt, Lady Bird Johnson, and Jackie Kennedy, all of whom claimed to have seen Lincoln's ghost or felt his presence during their years in the White House, though they weren't bringing in astrologers or using mediums like others did. As to how these Ladies formed a fascination with the occult, Krider told Broadly: "People who are desperate for help, for answers, sometimes go to extreme measures." The assertion that many of the former presidents' wives were "desperate for help" is easily argued. Pierce, the first-known First Lady occultist, came to bear the nickname "the shadow in the White House" and lived in a permanently depressed state after her last surviving child, her son Benny, died in a tragic train accident at 11 years old. Weighed down with extreme guilt and anxiety, she initially attempted to beckon his spirit by addressing an emotional letter to him, asking him to return to her so she could repent her motherly shortcomings. "God help me now to correct in bitterness my errors when oh! It is too late for you to have the sweet benefit of it—and now this Sabbath evening you will come in fancy before me and I sit close by you, with your hand in mine perhaps, or you will lean against me on the sofa, or as sometimes you did on Sunday evening sit on my lap a little while…" Pierce wrote. Determined to reconnect with her son, Pierce invited the Fox sisters, key figures in the Modern Spiritualism movement from upstate New York, into the White House to hold seances. Supposedly, the sessions provided Pierce some respite, though it wasn't lasting. According to her page on the White House website, at the conclusion of her husband's presidency, the couple "made a prolonged trip abroad in search of health for [her]—she carried Benny's Bible throughout the journey. The quest was unsuccessful, so the couple came home to New Hampshire to be near family and friends until Jane's death in 1863. She was buried near Benny's grave." 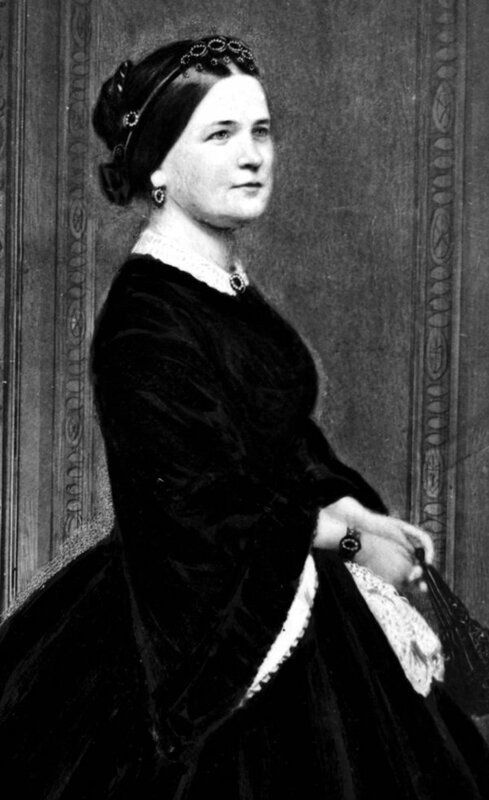 After the Pierces vacated the White House, life-long bachelor James Buchanan moved in for four years—so no witchy First Lady—but the next spiritualist to live in the White House moved in just after Buchanan's term: Mary Lincoln. Like Pierce, Lincoln lived through the deaths of her sons (one before Abe's term, one during, and one after), and her occult process of choice was also seances. Even the purportedly Honest husband himself attended a seance, according to historian Carl Anthony, that the Mrs. held in the White House Red Room. Apparently, she reached both her dead sons, Willie and Eddie, whose ghosts she claimed visited her in her White House bedroom. "[Willie] comes to me every night and stands at the foot of my bed with the same, sweet adorable smile he has always had," Lincoln told her sister, according to The Lincolns: Portrait of a Marriage. "He does not always come alone. Little Eddie is sometimes with him." After her husband's assassination, reports claimed she attended a "spiritualist commune," and seven years after his death, she asked the infamous spiritualist photographer William M. Mumler to take a couple's picture of her and her husband's ghost. As for whether First Ladies disproportionately dabble in the occult, Krider thinks there's no significant difference. In mid-19th century New York, the Fox sisters' public seances popularized Spiritualism, right around the time that Pierce and Lincoln were trying to reach their dead sons. Later, both Edith Wilson and Florence Harding consulted with the astrologer Madame Marcia Champney in the 1910s and 1920s, when for-profit fortune telling and astrological radio shows flourished until the Federal Communications Commission started its first term and cracked down on such broadcasts in 1934. According to a 1988 article in the Washington Post, Harding—whom Champney called a "child of Destiny"—"never made a move without first consulting her horoscope." Before Warren even took office, his wife was consulting Champney, and promised her that if her husband were elected, she would make Champney the official White House astrologer. According to the same article, she suggested to Champney that she would "[bring her] in through the front door, not the back"—a reference to how Florence Harding's predecessor, Edith Wilson, would sneak Champney in through the south entrance. People who are desperate for help, for answers, sometimes go to extreme measures. What these women do experience at a higher rate is the likelihood of being teased or criticized. In another Washington Post article about Harding and her best friend published in 1986, the same writer notes the "suspicious" First Lady's "obsession with the occult." During the end of Ronald Reagan's presidency, White House spokesman Marlin Fitzwater spoke to the New York Times about the Reagans' love of astrology after former White House chief-of-staff Donald T. Regan's memoirs uncovered the couple's habits. "It's true that Mrs. Reagan has an interest in astrology," Fitzwater said. "She has for some time, particularly following the assassination attempt in March of 1981. She was very concerned for her husband's welfare, and astrology has been part of her concern in terms of his activities." While the administration was careful to establish astrology had never influenced policy, Fitzwater did admit that it had an effect on scheduling; for example, the couple used astrology to determine the best time to announce that he would run for re-election. Decades later, Nancy's relationship (as well as her husband's more tenuous one) with an astrologer has been the subject of articles in USA Today and the New York Times, and the Los Angeles Times focused on her horoscope habit in her obituary last year, noting that she was mocked for it. And while Clinton's "imaginative exercises" could barely be considered spiritual or occult practices, her fake chats with Roosevelt were much chided, too. "[The public] primarily believes that the President and First Lady should have traditional beliefs," Krider told Broadly. "Many would think that belief in [the occult] would be considered un-Christian-like." But if for just one moment, you can be the type of person thinks of Nancy Reagan as a typical wife filled with dread at the possibility of her husband's death—and not someone who sat back and watched AIDS ravage through America in the 1980s—you can sympathize with Krider's ultimate point: "First Ladies are the same as everyone else," Krider said. "They have difficulties in their lives for which they struggle for answers."